Cigar narrowly defeating Soul of the Matter in the inauguaral Dubai World Cup. 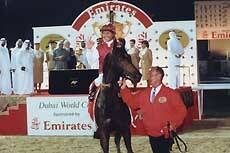 Singspel after winning the 2nd annual Dubai World Cup. Silver Charm won the 3rd annual Dubai World Cup and I'm working on getting a picture of his triumph. American jockeys have swept the 3 runnings of the Dubai World Cup with Jerry Bailey winning the first two, with Cigar and Singspel, and Gary Stevens riding Silver Charm to victory in the 3rd! Cigar (USA), Soul of the Matter (USA), and L'Carriere (USA) finished 1st, 2nd and 3rd, respectively, in the inauguaral running of the Dubai World Cup. Silver Charm (USA), Malek (USA/Chile), and Behrens (USA) finished 1st, 4th, and 5th, respectively, in the resent 3rd annual Dubai World Cup. The Dubai World Cup carries the co-richest purse ever seen in horse racing -- US $4 million (the Cup shares this honor with the Breeders' Cup Classic, also with a purse of US $4 million)! The man who made it all possible -- H.H. Sheikh Mohammed Bin Rashid Al Maktoum, Crown Prince Of Dubai And Minister Of Defence Of The United Arab Emirates. Local time in Dubai is GMT +4 hours. Average daily maximum temperature for March 25-28�C / 77-82�F. Dubai's culture is firmly rooted in Islamic traditions. Courtesy and hospitality are amongst the most highly prized of virtues. 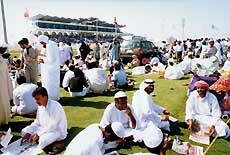 Dubai's society is marked by a high degree of different life styles. Foreigners are free to practice their own religion, alcohol is served in hotels and dress code is liberal. Women face no discrimination and may move around unescorted. Dubai remains close to its heritage, local citizens dress in traditional robe and headress. Arab culture and folklore find expression in poetry, dancing, songs, and traditional art. Traditional sports such as falconry, camel racing and dhow racing at sea continue to thrive. Dubai is exceptionally well endowed with top class international hotels which cater for the needs of both holiday-makers and businessmen. Recreational and leisure facilities are top class as are the business, communication and conference facilities. Dubai hotels play a major role in the social life of local residents as well as visitors and are well endowed with a wide range of imaginative restaurants, bars and other outlets, many featuring live entertainment from east and west. Taxis and car hire services are plentiful. Dress code for training is relaxed and casual and no different from any major training centre. For racing and formal occasions a jacket and tie or lounge suit are required. There is no dinner jacket/tuxedo requirement. For women, smart casuals for training and sightseeing, and formal dress for racing and major occasions. Evenings can be cool and therefore suitable clothing should be packed. For those that have not visited Dubai before, dress and behavior are exactly as for any other developed city, but there is the need for good taste and modesty to comply with local expectations, particularly outside the hotels. There are excellent private beach facilities in Dubai where the bikini is acceptable. Alcohol is available for visitors to the excellent hotels, restaurants, clubs/resorts and places of entertainment in Dubai. The city of Dubai at night. 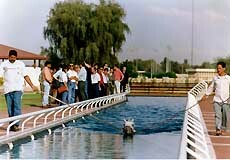 The following pictures are pictures of Nad Al Sheba Racecourse, in Dubai, where the Dubai World Cup is held. Training up to the Dubai World Cup. 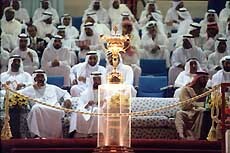 The Dubai World Cup trophy.